Is there any danger in shooting FN or HV bullets in double rifles or in older rifles? 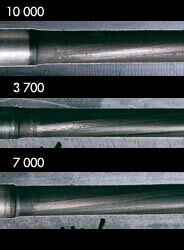 Do monometal bullets cause more barrel wear than jacketed lead core bullets? FN and HV bullets generate the lowest possible pressure on the barrel wall of all bullets currently available and cannot damage the structure of a double rifle barrel. HV and FN bullets do not compress lengthwise under pressure, to the extent that jacketed lead bullets do, with the resultant increase in diameter exerting more pressure on the barrel wall. Also, the rifling is only required to cut the driving bands and displace the cut bands to the rear, where there is space for the displaced material. See the picture of a fired and recovered FN bullet below left for more clarity. The GSC FN was recovered after fully penetrating a downed elephant and lodging in the earth behind it. With conventional monometal solids, grooved solids and jacketed lead solids, the displaced material is compressed into the shaft of the bullet under great pressure. It is also important to note that our bullets are manufactured from copper. 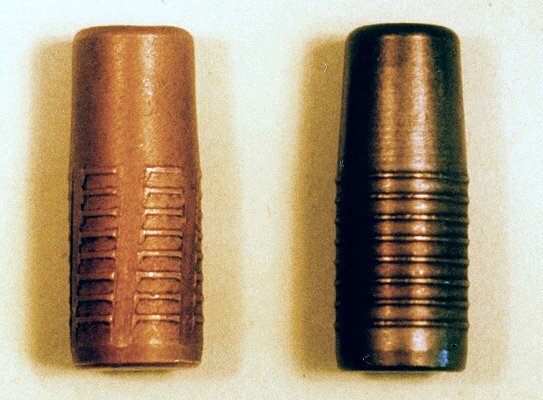 Many monometallic bullets are made from harder materials such as bronze alloys and the manufacturers themselves warn against the use of their bullets in doubles. 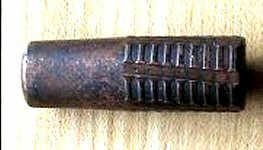 Some bronze alloys actually approach the tensile strength values of the barrel steels of older doubles. A bullet only needs to be as hard as is required to prevent failure after impact. The FN bullet in the first picture at the top, was recovered from the earth after an insurance shot, fully penetrating a downed elephant. The picture below is from an internet discussion forum and is a GS Custom .474 500 grain FN fired into an elephant shoulder at a little more than 2300 fps. It passed through the bone and gave a total of 6.5 feet of penetration. Clearly, GS Custom bullets are hard enough for any job at hand and any bullet that is harder, will simply result in more barrel wear without any additional benefits. Should your double rifle or other firearm have an unusual bore / groove configuration, we can make special run bullets to suit the bore of your rifle exactly. There is no extra charge for this service. 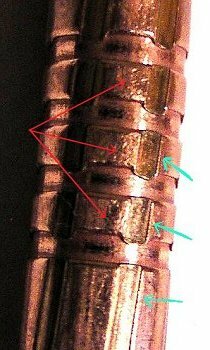 With the extra speed that can be obtained with HV and FN bullets, how is flame cutting of the throat of the barrel affected? Throat erosion is accelerated by increased pressure and temperature. The scenario effectively feeds on itself in the sense that elevating pressure will have a tendency to raise temperature as well. With HV and FN bullets extra speed is obtained without elevating pressure beyond normal levels. 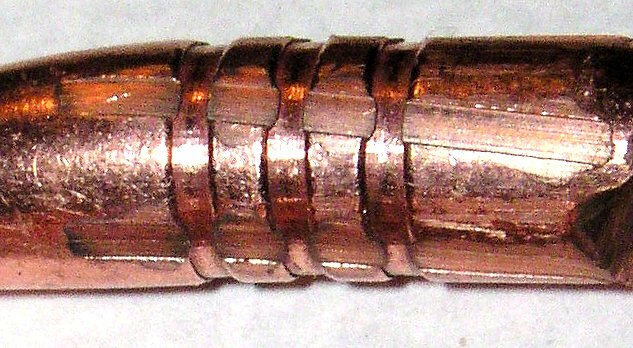 The drive bands make entry of the bullet into the bore very light. HV, SP and FN bullets are manufactured at barrel bore diameter and only the drive bands are at barrel groove diameter giving a good gas seal with no blow by of gas. As the pressure curve rises, the expanding volume behind the accelerating HV/FN bullet increases much quicker than with smooth or grooved bullets. Smooth and grooved bullets have nose shapes that terminate at barrel groove diameter and the last section of ogive and the first portion of the shank are much harder to engrave than the thin drive bands on HV and FN bullets. The advantage of this is that with HV/FN bullets, the pressure curve peaks further down the bore and the initial temperature spike is distributed over almost three times the surface area of barrel, compared to smooth and grooved bullets. The throat runs cooler and lasts longer. It is possible to mimic the features of HV/FN bullets with grooved and smooth monometallic bullets. By manufacturing a monometallic bullet that is undersize for the barrel, engraving force is lowered and the gas blowing past between the barrel wall and the bullet, acts as a relief valve to slow the rise of the pressure curve. This also requires more powder to be used due to the loss in pressure. The increased powder charge sustains the pressure curve rise for a longer period, accelerating the bullet to a higher speed at the muzzle. The price for this is paid eventually in drastically reduced throat life and the resultant loss in accuracy that follows. If a recovered bullet is examined, it is easy to determine whether the bullet sealed the barrel properly or not. See the pictures below for examples of this. Bullets can also be measured and compared to the CIP and SAAMI data available here. This bullet below was under size for the barrel it was fired from. Note the surface texture of the engraving left by the lands of the barrel and compare it to the texture indicated by the red arrows. 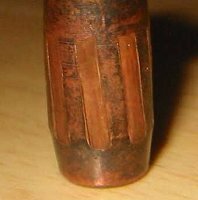 It is clear that the diameter of the bullet was too small to cause it to bottom out in the grooves of the barrel. The green arrows indicate where metal was raised by the lands to a height that corresponds with the amount by which the bullet was under size for the barrel. 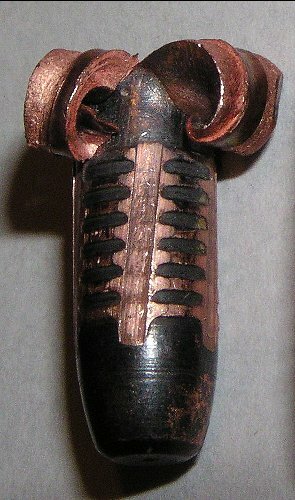 Here is an HV drive band bullet that indicates full contact with the barrel lands and grooves. The gas seal is good and no blow by can occur. 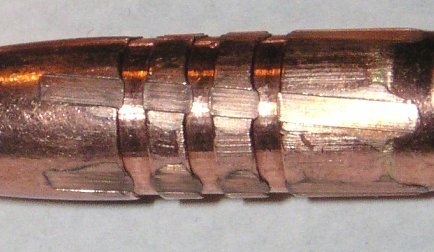 Compare the small amount of copper that is displaced by the rifling to the amount displaced on the bullet at left. Below is a relatively extreme example of an under size bullet. Note how the material that was displaced by the rifling flowed into the space between the surfaces of the bullet and the barrel. Gas cutting with such a combination will be accelerated due to the ineffective seal. Defence Science and Technology Organisation. "Significant leakage of high-pressure propellant gas past the projectile during firing can create jetting, thereby exacerbating erosive flow effects.Andrade additionally proposes that the blow-by flow contributes to projectile instability, causing balloting and muzzle-end mechanicalwear. The effect of blow-by on erosion has been observed by Lawton and Laird  during experiments using a 30 mm cannon and vented vessel. In approximately half of rounds fired, they observed a short-duration temperature pulse at the OR indicative of blow-by. The resulting temperature rise was calculated to locally increase erosion by 200 to 300%." Also see: Wear and Erosion in Large Caliber Gun Barrels, by Richard G. Hasenbein, Weapon Systems & Technology Directorate, Armament Engineering & Technology Center, U.S. Army Armament Research, Development & Engineering Center. It is clear that gas jetting past a bullet, as it accelerates down the barrel of a rifle, must be avoided. Sooner or later the shooter will pay the price in the form of gas erosion. Accuracy reduces and the barrel has to be replaced. My understanding on speed is that if your muzzle velocity begins to exceed 3000 fps, barrel life is reduced considerably. This is probably why so much attention is being given to new bullet coating processes which reduce pressures and consequently barrel wear. (Some manufacturers guarantee that their coating will not rub off!!!) So, to look into the future, would the ideal be a premium grade bullet, like your monometal copper hollow points with reduced weight, to obtain muzzle velocities of 2800 - 3500 fps and coat them so that barrel life is similar to conventional bullets? Barrel wear with monometal bullets has been a bone of contention from day one, despite the fact that evidence points to the fact that wear with monometal bullets is less than with jacketed lead bullets. However, all our bullets come standard with a double coated process. The bullets are washed and then chemically oxidised to a depth of 2 to three micron. This oxide coating is softer than the base copper and also more "porous" for want of a better word. We then apply a chemical coating that bonds to the base layer. There are several different types of chemicals and you can rest assured we use the correct one for the application. If you couple this coating with our HV concept bullets (S.A. Patent # 97/10275), the result on barrel life is outstanding, despite the extreme velocities we go to. Have a look at a test we did to prove the difference between HV technology bullets and old style smooth bullets as well as grooved bullets. A thought on coatings that rub off. Up to 1993, I was actively involved with Practical Pistol Shooting. I also manufactured cast lead bullets then. When I officiated as range officer, I often noticed bits of bullet lube on the targets. It occurred to me that the lube is supposed to lube the barrel / bullet contact. If we wanted to lube the targets we could use a bucket and brush more efficiently! This prompted me to experiment with a variety of lubes. To cut a long story short, I found that a soft lube, that would leave the bullet completely devoid of lube as it left the muzzle, was most conducive to accuracy and also kept barrel temperatures lower than the harder lubes. Applied to the higher speed of rifles, one must ensure that there is no residual left from the coating in the bore. In our discussions with our coating supplier, this was also their line of thinking, hence our method of coating. The downside of our coating is that it is not as visually appealing as some others, but I have always opted for practicality over style or fashion. Even with conventional moly-coating, there is no problem if it is done right. The item below is from the http://www.6mmbr.com website. The enormous forces that build up in rifle barrels cause severe wear to lands and grooves. Here is a close-up of the throat wear in three different 6.5x55 barrels. These Norma test photos show wear after 10,000 shots with Norma Diamond Line "Bana", after 3,700 shots with uncoated bullets, and after 7,000 shots with Diamond Line F�lt. Compare the results for yourself. Norma claims "testing showed barrels retained accuracy more than twice as long when Norma moly bullets were used from the outset. This is because Norma Diamond Line is coated with molybdenum disulphide and a protective layer of wax. Friction is reduced which means that the bullet travels further along the barrel before peak pressure is reached. The result is lower wear and improved accuracy".